One year my doctor said I should try progressive glasses. If you are young and do not know what progressives are, let me fill you in. 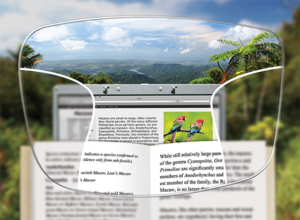 Progressive lens have up to nine different sections for the user to see through. For this reason you need bigger glasses. When wearing them you have to get used to using each of these nine corrections. One sees far away while another sees up close and in the middle, well, those sections see everything in between. Your eyes eventually figure out how to use each of these divisions to search for the best view. Oh, and the view, is only in the middle. The sides, well those are blurry too. Now, image having MS vision problems and then putting on progressive lens. Stop laughing. It’s not funny. Okay, it is a little funny. No way, no how could I see through progressive lens when struggling with MS visions issues too. That was in my younger years. Now that I am older, I kind of want to see. Taking the time to adjust to the progressive prescription may be in my future. Melissa Cook is the author of www.MSsymptoms.me. As a retired high school teacher and school district administrator, she chooses to share her MS story in hopes of benefiting others.